Have you ever wondered what happened to Cleopatra's children after her after her death? Michelle Moran tells us in her new engrossing novel. Michelle Moran writes a sweeping novel of some of the beauty and severe brutality of Rome. This is my top pick for 2009. Juana, daughter of Queen Isabel & King Ferdinand of Spain was raised to be a pawn. She was betrothed as a toddler to Philip of Flanders, heir to the Hapsburg throne, to improve political alliances with Spain. This is an enthralling story of greed, lust, power, loyalty, and friendship. C.W. Gorther keeps the story going in perfect pitch! I could not put this book down and it kept me up into the wee hours of the morning. When her mother died, Pan Yuliang was sent to her uncle's house. He raised her along with the help of a maid. She was to be promised to a man and then be married. That is what her mother's wish for her and a promise from her uncle. However, her uncle had a drug habit and ran out of money. He had to get drugs somehow, so he sold Yuliang into prostitution at the age of 14. How she become a famous painter from there is a very interesting story! I cannot recommend this book high enough. It does not disappoint! Will Somers starts out with a dull life in the country on the family farm. Even his family admits that he doesn't make a good farmer. That doesn't leave him with any real options, until an option lands in his lap. Margaret Campbell Barnes envelopes the reader into the pages of her book. It is a compelling read and captures the period and Will Somers well. This book is hard to put down! Highly recommended! This is the story of how Will became King Henery VIII's fool. This is the story of how Arthur became King and how Gwenhwyfar became his Queen. There is no magic here as in some of the other books on the subject. Helen Hollick leaves out all the usual mystery and magic. 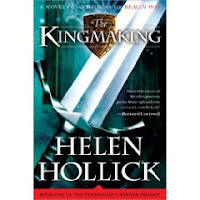 There is no mention of Merlin and Lancelot, which in my opinion, makes her version more plausible than other versions of the story.Hollick's writing is smooth and beautiful. She seamlessly transports her readers back to the Dark Ages. The Last Queen and The Kingmaking were on my list as well. I don't know why Cleopatra's Daughter wasn't. I certainly meant to put it on there. I have King's Fool here to read at some point, and Painter from Shanghai has been on my TBR list for ages too. I have only read the last two from your list but since I agree that they truly were one of the best reads in 2009, I will have to reach out for the other three. They must be just as good. Heather, it sounds like we have simular tastes in books. 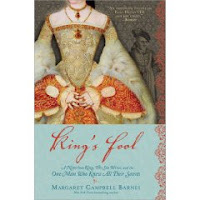 Marg, I know that you will enjoy both King's Fool and Painter. Lilly,I think you would enjoy all three. I looooved Cleopatra's Daughter! I'm going to check out the others on your list! The Kingmaking made my list as well and Cleopatra's Daughter and The Last Queen are on my to-read list for 2010. The Painter From Shanghai sounds very interesting...I may have to add it to the pile! In the Hammock, it was so good. You would probably enjoy the others as well. Lady Quinlan, I think you would enjoy Painter. I am in the middle of Cleopatra's Daughter right now and I do have to agree with you that it is a great read. I will have to take a closer look at all your other picks as well. They all look so good! I hope you have a very Happy New Year! Love this button! May I grab it for my own post? The Last Queen was one of my favourite reads this year too. Speaking on behalf of Alex who did the creating of the button, I would say that this is okay with credit! Of course, if Alex comes back and says no, then we will have to deal with that together! LOL! Zibilee, I think you would really enjoy The Last Queen and Painter. Happy New Year! Miss Moppet, Alex is the creative button maker of our group, as Marg said. I don't know what we would do without her. I've used it for my New Year's Eve post, credited - many thanks to Alex! The only one on your list that I have read is Cleopatra's Daughter, and I really enjoyed it. Alyce, I think you would also enjoy The Last Queen as well.